Wind howls unfettered for hundreds of empty miles across the great plains of North Dakota, tearing over wheat fields and abandoned farms, roaring winter and summer, horizon to horizon, to rake one of the flattest places on the planet. Loft a large kite during a gale and you might be pulled off your feet, the fabric flexing, the string snapping tight in an explosion of energy and air. Or, rig things right and the power of wind could pull you across the state, from the town of Crosby at the Canadian border, south and east along the Missouri River, then—390 miles down the map—to the end of the journey, to the state line and South Dakota. 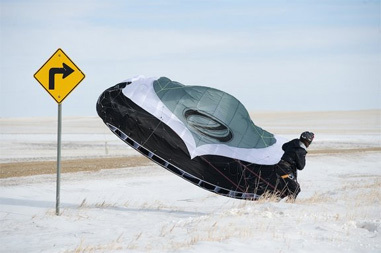 That’s the goal of the 2XtM Expedition, a three-week journey that began Feb. 11 to attempt to traverse North Dakota via the nonmotorized sport of snowkiting. The 2XtM crew—which includes athletes Sam Salwei and Jason Magness of Grand Forks, and Californian Paul Cassedy—will travel self-sufficiently, hauling all food and gear in backpacks, melting snow on a stove for water and sleeping out each night in temperatures that may drop well below zero. 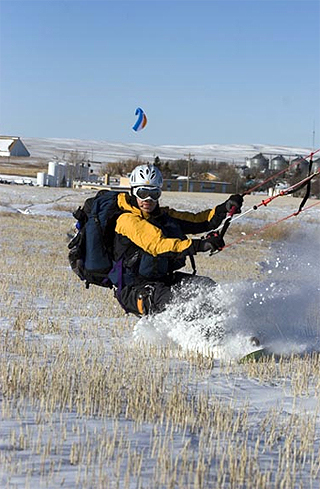 Snowkiting, a growing sport with roots in the Midwest, uses giant paraglider-like canopies to pull skiers or snowboarders across flat land. With a strong wind, kiters can sail 20 or more miles in an hour, skimming over snow, cruising up hills and back down, flying off drifts on a ride unlike any other. 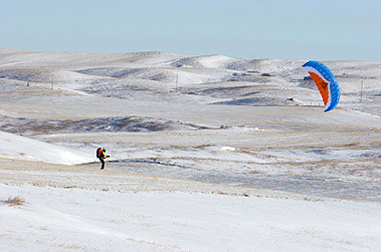 But for 2XtM—which stands for “To Cross the Moon” in reference to North Dakota’s desolate winter landscape—Salwei and crew are kiting for more than thrills. 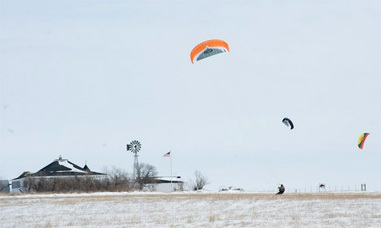 By literally being blown across the state, the athletes hope to raise awareness for the potential of renewable wind energy as an alternative to coal or petroleum. Proponents say that windmill farms on the Great Plains could provide a significant portion of the region’s energy needs. Indeed, a single large turbine cranking in the North Dakota breeze generates between 1.5 and 2.5 megawatts of energy, according to Jim Lesinski, a vice president at Mortenson Construction, a Minneapolis company and a sponsor of 2XtM. “That’s enough to power 300 or more homes,” Lesinski said. Mortenson, a multibillion-dollar company hired to build high-profile projects like the new Minnesota Twins ballpark, is also among the biggest builders involved in wind power. North Dakota is a focus for the group: Last year a project in Ashley, N.D., included 120 turbines capable of delivering 180 megawatts of power, Lesinski said. “Working with 2XtM was a natural and obvious fit,” he added. In addition to its eco-message, 2XtM, which has more than a dozen sponsors, decided to work when possible only with companies that have a sustainable message or environmentally friendly products. This includes a backpack company from New Zealand, a fiberglass provider that makes turbine blades, Steger Mukluks, plus a wool sock maker in Colorado and a clothing company from Southern California. For food, the crew stocked up at the Amazing Grains co-op in Grand Forks. Their diet, which includes about 5,500 calories a day each, is strictly vegetarian, with oatmeal, dried fruit, powdered milk, hummus, flatbread and dehydrated Indian cuisine as primary foodstuffs. The message of 2XtM is being told in dozens of communities throughout North Dakota. In tandem with the three snow-kiters, a community outreach crew is traveling the state by van to give presentations on wind energy, climate change and the sport of snowkiting. As the athletes battle cold and blow in the breeze, the outreach crew travels to middle schools, churches and community centers with multimedia presentations. Out on the prairie, where Salwei, Magness and Cassedy sail for up to eight hours a day, the task at hand is more solitary. Most days they see few other people. Their route follows deserted highways, where they ride in the ditch, and the Missouri River, a desolate plane of ice that courses south and east for hundreds of miles through the state. “We see an occasional ice fisherman out there,” Salwei said. But at the State Capitol in Bismarck, 2XtM has garnered some high-profile visibility, with senators, the state agriculture commissioner, and tourism directors following the crew’s progress through the plains. Salwei may be understandably swept up in the endeavor when he says the goal is to complete “the biggest expedition the state has seen since Lewis & Clark.” But the group—three young men with kites, four people in a van—have something larger than themselves in mind. They’re striving to make an impact. Trying to give voice to an issue. Hoping to make real the invisible power of wind, the breath of the Earth, tangible and alive in the arching canopy of kites coursing southward in the North Dakota sky. previous:The Gear Junkie Giveaway is back!